Remember back in the late 70’s and early 80’s when people were dropping loads of quarters into Atari’s Asteroids video game? Remember how much fun it was at the time driving the “little triangle” around a black screen dodging and shooting odd-angled space bodies? (For those who don’t, download it for your phone. Quickly live the fun.) Well, Avishay Orpaz’s ASTROGUN is nothing like Atari’s hit video game. However, now you can exact a first-person revenge on those digital space rocks. The game is pretty simple to play ─ the player aims the weapon at incoming asteroids projected on a transparent screen coming in from all directions and shoots them with the gun controller. A handy RADAR screen gives the locations of the incoming rocks, making it easier for the player to get a bead on the threats. 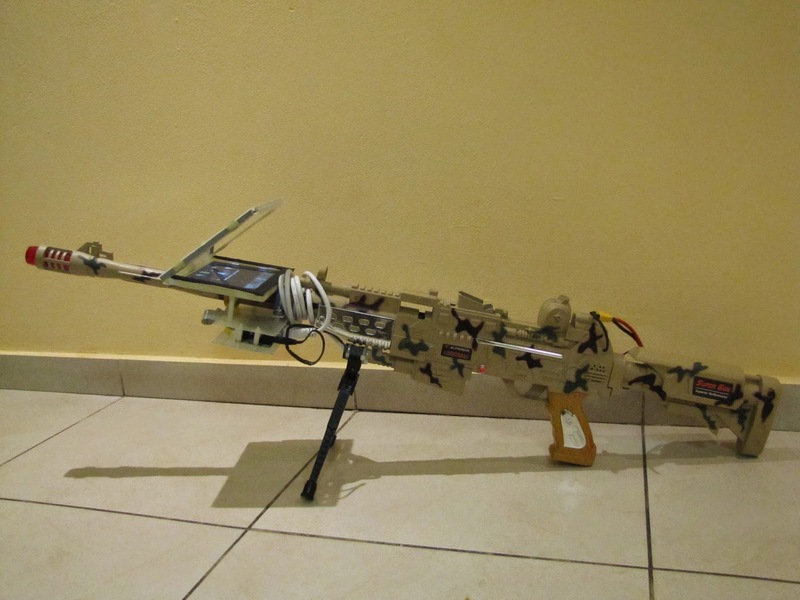 The weapons ‘ammo’ consists of a Raspberry Pi SBC (Single-Board Computer) with an attached SparkFun IMU, which interprets the weapon’s orientation. The Pi uses that information to draw the asteroids from specific angles or trajectory paths so when the player moves the paths change accordingly. The images are projected on a transparent screen (mounted on the weapon) comprised of two parts, an LCD panel and beam-splitter glass (the same glass used on President Obama’s teleprompter), which allows the player to see super-imposed asteroids on living room walls, ceilings and floors. All the source code needed to build your own can be found on GitHub. The hardware built into the gun is all ad-hoc and not documented but can be improvised depending on what type of $12 flea-market toy gun users purchase.